Following the success of the Virgin Atlantic inflight safety video art directed, designed and illustrated Art & Graft, Virgin Atlantic decided to refresh their suite of safety cards. We designed a suite of cards with a modular system, which the layout divided into areas for each stage of the flight. These are ordered chronologically so it is easy to follow and the most widely needed information is presented first. Each card was allocated an icon with 90-degree rotational symmetry. This means that only one symbol needs to be placed on each card, as it can be read when the card is placed horizontally or vertically in the seat pocket. We also simulated the appearance of each card as it would be seen by a person with colour blindness to make sure that the cards were distinguishable. 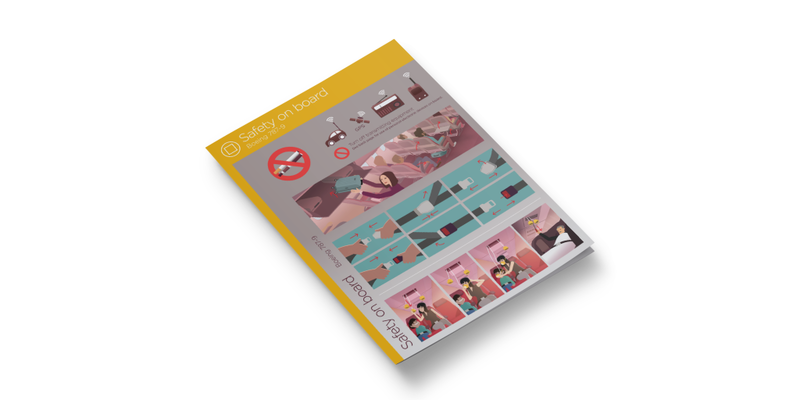 The style and characters from the Art & Graft designed inflight safety video make the safety cards eye-catching and distinctive. The attractive characters and warm colours enable the cards to communicate vital safety information in a clear and reassuring way. Working from detailed hand-drawn drawn layouts, provisionally approved by the CAA, the illustrators at Art & Graft were able to art direct and create the finished series of illustrations that could be dropped into the different safety cards. Thanks! Almost finished... We need to confirm your email address. To complete the subscription process, please click the link in the email we just sent you.